Hiroshima Applique Needles #10 are high quality needles made in Japan. They are polished lengthwise to ensure smooth fabric piercing. Contains 6 needles. Hiroshima Embroidery Needles Assorted #3 4 5 & 6 are high quality needles made in Japan. They are polished lengthwise to ensure smooth fabric piercing. Contains 2 needles each of size #3 4 5 & 6. 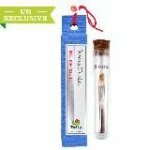 Hiroshima Embroidery Needles Assorted #7 8 9 & 10 are high needles made in Japan. They are polished lengthwise to ensure smooth fabric piercing. Contains 2 needles each of size #7 8 9 and 10. 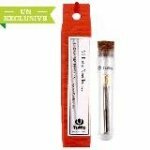 Hiroshima Embroidery Needles Sharp #8 are high quality needles made in Japan. They are polished lengthwise to ensure smooth fabric piercing. Contains 8 needles. Hiroshima Embroidery Needles Sharp #9 are high quality needles made in Japan. They are polished lengthwise to ensure smooth fabric piercing. Contains 8 needles. Hiroshima Milliners Needles Assorted #3 5 and 7 are high quality needles made in Japan. They are polished lengthwise to ensure smooth fabric piercing. Contains 2 needles each of sizes #3 5 and 7. Straw needles. 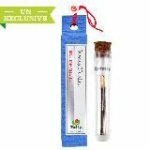 Hiroshima Milliners Needles Assorted #8 9 and 10 are high quality needles made in Japan. They are polished lengthwise to ensure smooth fabric piercing. Contains 2 needles each of sizes #8 9 and 10. Straw needles. 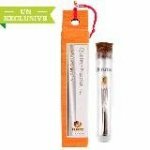 Hiroshima Quilt Basting Needles Long/Regular are high quality needles made in Japan. They are polished lengthwise to ensure smooth fabric piercing. Contains 3 long needles and 3 regular needles. Hiroshima Quilting Needles Between #10 are high quality needles made in Japan. They are polished lengthwise to ensure smooth fabric piercing. Contains 6 needles. Hiroshima Quilting Needles Between #8 are high quality needles made in Japan. They are polished lengthwise to ensure smooth fabric piercing. Contains 6 needles. Hiroshima Quilting Needles Between #9 are high quality needles made in Japan. They are polished lengthwise to ensure smooth fabric piercing. Contains 6 needles. Hiroshima Sashiko Needles Assorted are high quality needles made in Japan. They are polished lengthwise to ensure smooth fabric piercing. Contains 2 needles of the 3 different sizes included. Hiroshima Sewing Needles Sharp #8 are high quality needles made in Japan. They are polished lengthwise to ensure smooth fabric piercing. Contains 8 needles. 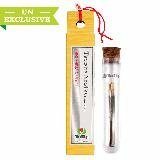 Hiroshima Sewing Needles Sharp #9 are high quality needles made in Japan. They are polished lengthwise to ensure smooth fabric piercing. Contains 8 needles. Hiroshima Tapestry Needles Round #23 are high quality needles made in Japan. 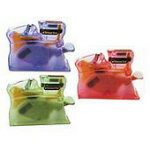 They are polished lengthwise to ensure smooth fabric piercing. Contains 6 needles. 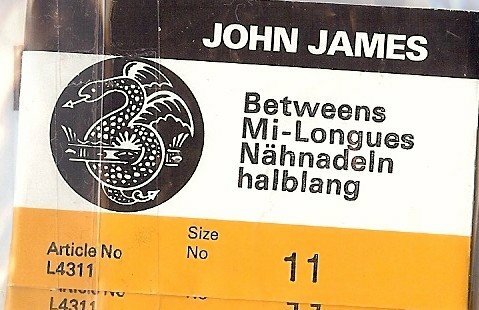 'John James Embroidery needles size 8. pkg of 16 needles. 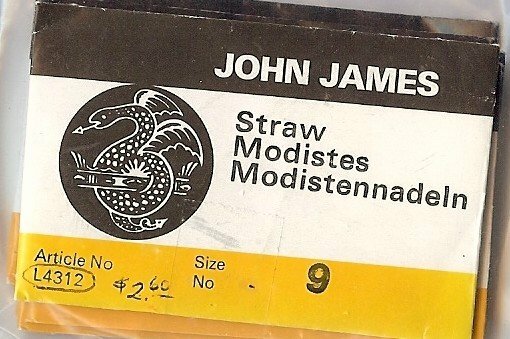 'John James 25 assorted Handsewing Needles' with threader. Sharps Embroidery/Crewel/Darners.